Adviser is a person who gives advice. An advisor does the same thing—the only difference is in the spelling. Adviser is the older and the preferred spelling. 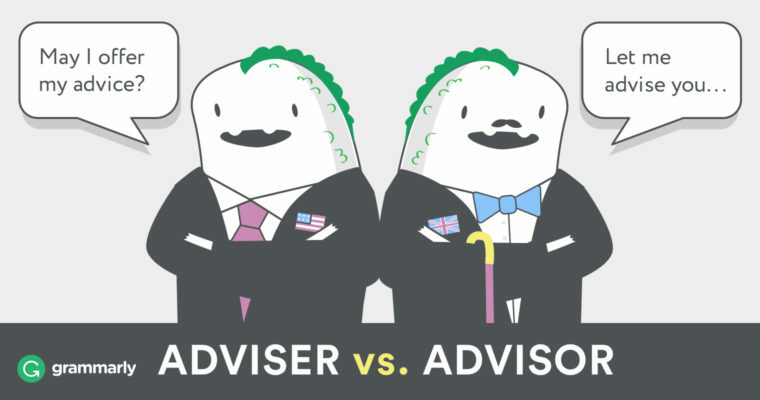 Advisor vs. adviser is probably not the most important or the most annoying conundrum related to the verb advise. That honor goes to advise vs. advice because mixing them up is a more damaging mistake. But still, people wonder about advisor and adviser because we don’t have two different spellings for every word in the English language—it’s not common. And there’s always the notion that different spellings of the same word might convey at least a slight difference in the meaning. All the more reason to figure out, once and for all, which of the two spellings is correct, or which is more correct than the other, and whether they carry different meanings. Advisor and adviser are what we call agent nouns, nouns that are used to indicate someone who does something. If you’re reading this article, then you’re a reader. If you like to write, you might be an aspiring writer. People who dance are dancers, those who translate are translators. So, people who advise are advisers. Or advisors. The difference between advisor and adviser is mostly in the suffix used to create the noun from the verb. Yes, there are some who claim that the -or spelling is better suited for titles. But this can hardly be called a rule because you’ll often see the other spelling, the -er one, used in professional titles. So it really comes down to the suffixes. -Or is more commonly used with verbs that have a Latin origin, although -er is the go-to suffix for agent nouns. There’s also -ist, which is sometimes used for verbs that end with -ize. So, it can be said that adviser has a more Germanic tint, while advisor has a classical, Latin feel about it. But the meaning of the word, whichever suffix you use to make it, stays the same. Advisor, Adviser—Which One to Use? So if neither of the spellings is wrong, are there any reasons you should choose one instead of the other? For one, there’s consistency. If you plan to include the word in your text, it might be best to choose a spelling and stick with it. Which spelling you choose might depend on where you are, and where your audience is—adviser is the strongly preferred spelling everywhere apart from North America. In the U.S. and Canada, it’s more common to see advisor as a part of official titles, and it’s also the spelling that’s seemingly preferred by the U.S. Government. But then again, you’ll notice that some newspapers, including The New York Times, prefer adviser over advisor. The AP Stylebook agrees. In academia, however, advisor is the term that’s more commonly used on both sides of the pond. Some industries might use one of the two spellings whether it’s the norm in their country or not. Consequently, your choice of spelling might depend on multiple factors. The important thing to remember is that neither of the two is wrong.